The craziness in my life continues... I have pretty much had no time to do my nails this week. Thus it has been a nice week of Sally Hansen Insta-Dri polish - I will have to swatch out my collection of those for you all sometime, they are a lifesaver when you are crazy like me and will chew off your nails if they look bad, but are too busy sometimes to spend much time on them! Today I have for you a little teaser of things to come... this weekend I will be swatching Zoya's new polishes, and I cannot wait, they are all so stunning! Here is a mani I did with a couple of these polishes, that I just loved! This is two coats of Zoya Breezi, a gorgeous dusky blue creme that went of deliciously smooth. 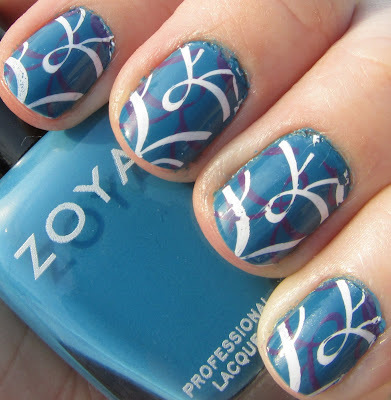 For the pattern, I used Konad plate M63 and Zoya Kieko and Konad Special White. These nails just remind me of a party. I wore them for several days (both because of my hectic life and because I just didn't want to take them off) and got a lot of compliments! I love the new Zoya collections and can't wait to share them in full with you - check back this weekend for swatches and reviews! DISCLOSURE: The polishes featured in this post was provided to Polishology by Zoya for review purposes. This is an honest and independent review and was in no way influenced by the company. Looks great! I know what you mean about busy...if it weren't for fast-dry top coats, I'd never have my nails done! Mani looks great! Can't wait to see the Zoyas! It does look like a party! How did Zoya stamp? I've only got 3 colours of special polish and I've noticed some of my regular nail polish stamps really well and some doesn't. Seems like Zoya would be thick and fluid enough to stamp well. OOH I like this a LOT! I like the layering you did there, with the stamp going two different ways. Glitzkreig - Zoyas often stamp well. Some are less pigmented than others, but in general I have found all cremes and most shimmer/glitters from them to stamp very well. The cremes especially.